We get this question on a daily basis here at Jungle Scout. “Can I sell on Amazon US if I am based in a different country?” or “How do I sell on Amazon US if I live outside of the USA?” So much so in fact, I thought I would put this post together to share the good news, that YES, you can, in fact, sell on Amazon US from ANYWHERE in the world and I’m going to explain exactly how to do so. Want to watch us explain how to sell on the US Marketplace too?! Watch this video! You can sell from Amazon US Marketplace from all corners of the globe, given you have a good internet connection! We have Jungle Scouters working for our team (Including myself!) 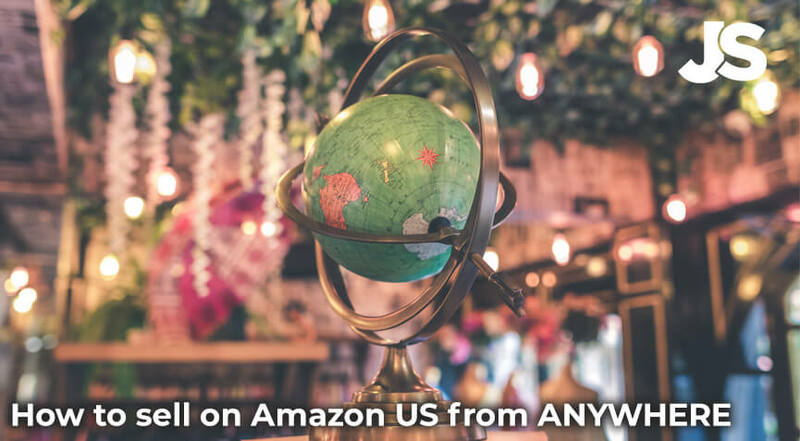 living and traveling across the world who sell on Amazon, so we have all the information you’ll need to get set up in no time! For the past year and then some, I have been traveling and living outside of the United States, and still selling private label products on Amazon as efficiently as if I were tethered to my desk like the olden days. Let Amazon handle all logistics and inventory storage, give me a good internet connection, and I have just gained my freedom to travel the world! So I don’t need to be in the USA to sell in the Amazon US Marketplace? So let’s get things straight, you do NOT need to be living in the USA to be eligible to sell on Amazon’s US store. I’m going to show you all exactly how to accomplish this so that you could be chillin’ on a beach in the Maldives or taking in the Northern Lights in Iceland, all the while selling on Amazon’s US marketplace. Why Is It Better to Sell on Amazon’s U.S. Store? First, a little context on Amazon U.S. and other international Amazon stores. Amazon’s largest region is North America (mainly sales from the U.S., but also Canada and Mexico), and the UK, Germany, and Japan make up the lion’s share of revenues. However, Amazon’s most innovative services, such as Prime are so well utilized in the US, that in order to execute such a logistically intensive operation, Amazon needs to have a dense network of distribution centers and warehouses developed in the States. Check out potential US Marketplace products using the Product Tracker. I want to preface this first by stating the obvious: I am not a financial advisor, tax lawyer, or otherwise. I just know this from my own experiences, and am sharing it from my time as a seller living outside of the States. So I am not going to delve into the state or federal tax requirements, but I obviously recommend that you do your due diligence and speak to a trusted advisor on that. When setting up your Amazon store, here are some basic pieces of information you will need to prepare. Provide a credit card that can be charged internationally, Visa or Mastercard. A phone number—if you get a Skype US phone number, that will work in your favor. You will need to provide US bank account information. This may be a hassle as many banks require your presence in the States, but you do want Amazon to have a legit account to send the money, right? One solution that you can use is Amazon’s Currency Converter for Sellers (find that here). Granted, I have not gone through this process myself as I have a US bank account, but I know ACCS basically allows you to sell in foreign Amazon marketplaces without opening a bank account in that country. Instead, you are paid directly in your local bank in your local currency. Pretty sweet, huh? The one small caveat is that you can only receive payment to a bank account in a country and currency supported by ACCS. There is also a list of all the countries and currencies supported by Amazon’s Currency Converter for Disbursement. There are some steps that you will have to follow in order to streamline the importing process. Create Your Amazon Listing: You have to create the listing on Amazon first, in order to receive the shipping destination and FBA warehouse that you will be sending the product to. Choose Your Customs Broker: In order to import your item into the US, you will need a Customs Broker to get your product into the States (unless you ship via Air like UPS, DHL, FedEx, in which case it is included as a service). Your customs broker will guide you through the exact process of clearing your shipment, and the requisite paperwork, documentation, taxes, and more. This is perhaps the least enviable aspect of selling on Amazon’s U.S. store, but something that all importers have to go through! I went into more detail about the importing and shipping process in this post here. I don’t want to rehash the same information, but definitely take a look at that as well for information about importing from China into the United States. I think this is the trickiest part, and once you find a great partner, it makes all the difference in the world. I use Flexport. They handle all the customs, freight forwarding, and inventory storage for me. They are injecting the importing game with a much-needed dose of technology, which is so critical in saving time and headaches. I do not necessarily want to recommend or comment on other services that I do not have first-hand experience, but with a quick Google search you should be able to identify the main service providers, and also other people’s experiences with different companies. Check Samples: As you may have seen with the marshmallow sticks that I have launched, there is a range of quality in both the physical product and the supplier themselves. You can be the judge of what the supplier may be like (communication skills, responsiveness, background check, etc), but you can’t necessarily get a great gauge of the quality of product if you don’t handle it yourself. Have the supplier send to you directly, wherever you are in the world, or have them send it to friends/family that can vet the product for you. Don’t just rely on photos or the supplier’s word when examining samples, you want a trusted source on your behalf to evaluate the product! Quality Assurance: Though you will probably never touch your product if you are abroad, you want to make sure that the quality of the finished product matches the quality of the sample. I have seen and heard cases where there is a noticeable difference between the two. For my marshmallow sticks, I checked the first batch of 100 units, which were up to par, and then I have not touched the product since. Bamboo marshmallow sticks are fairly straightforward to produce, but if there is some nuance to the production or something that is fragile or requires precision, you may want to look into third party inspection services. I would recommend doing this while the product is in China, where it would be easier to rectify than once it has gone through the importing process. Fulfillment Prep Centers: I have seen more of these services pop up recently, as there is a need to get products from your overseas supplier to Amazon’s warehouses. Normally I am a big advocate of removing any middleman possible (why reduce your profit margin that we work so hard for if at all possible? ), however, I definitely see a need for these services. It is similar to an insurance policy that everything from the factory is prepared accurately according to Amazon’s guidelines. It is even so important for overseas sellers to get all of the packaging and prep requirements to meet Amazon’s standards. You can see their detailed instructions here. If your products are not received by Amazon ready for fulfillment, you will incur additional fees, and worse yet, Amazon will reject the shipment and return it to you at your own expense. Storage: Depending on the size of your product, you will want to look into storage options. Depending on how new of a seller you are, and how slowly your inventory moves, you may be subject to Amazon’s Inventory Storage Limits, particularly for items that are classified by Amazon as oversized. This becomes a bit of an inventory management game, as you may want to order 1000 more units from your supplier, but can only house 500 units at a given time. Flexport is great for this, as they store inventory at their warehouses until I decide to send it to Amazon’s warehouse. The fees are very reasonable, but again, you should do some searching on Google or Amazon seller forums to find alternatives. hanks for this invaluable information. I live in Jamaica and would love to sell on Amazon. However, Jamaica is not listed as one of the countries and currencies supported by Amazon’s Currency Converter for Disbursement. In Jamaica, our banks issue visa cards that we can use to shop anywhere in the world. I am a frequent shopper on Amazon. I’d like to know which address should I place in the Business Address field if I’m planning to start as an Amazon FBA seller (sending products directly from China to US buyers)? The main part of my issue is that I actually live outside USA (in the Dominican Republic). Good question. As far as I know DR is available to sell on US. But I’m guessing that your biz address would have to be wherever your LLC/SSN is tied to. Although I’m not certain of the things you need to do to register in Jordan, it is one of the countries that Amazon allows people to sell from. Thanks for the Article and it is wonderful for newbie like me, But i have a Questions with which i am walking here and there but not getting enough clear information. If i am sending the Product living outside the USA to amazon FBA, on that case Who is the Importer of the Product that getting into USA? 2. If i am a Non US citizen and i want to Sell on Amazon FBA, if i send my inventory from China to FBA, Will the Forwarder need any types of Documents to get the item cleared from US Custom? I heard on some blogs, it may require EIN, SSN etc. but being a non US citizen i don’t have either of them. In this Situation how would you help me? I have been selling on Amazon FBA in the UK and US from Ireland for two years. It is very straight forward to set up but it is also very important that you set up correctly from the start as Amazon doesn’t allow you to change your details easily and they will automatically suspend your seller account if you try to change your details. I learned from a UK based seller called James Greaney. He is from Ireland but he has been selling on Amazon UK and USA since 2013. He shares lots of helpful tips on his Youtube channel Internetbizuni and I hired him to teach me the process when I first got started. Use a UK LTD company. Send your products to a prep centre in Northern Ireland and from there to Amazon FBA via low cost delivery service UPS. Make sure to give your correct bank and company details from the start as they are hard to change later. I from and I live in Kuwait if i want to sell in Amazon , can i establish an LLC American company ( set up an LLC and a US bank account) thereafter I can register in amazon fba and i can sell? if yes , can i use my amazon account to sell in US from my home in Kuwait ? i mean IP from Kuwait or i must be in USA to use my amazon fba account? OR is there a way can I sell products on UK/USA or even in Europe in case i am in Kuwait? You might contact Amazon or an Amazon legal expert to see what you can do. I’m not sure about that one. You might check with Amazon directly to see the process for selling from Jamaica. But as far as I know, Jamaica is on the list of available countries. I recommend doing digital sales first. You can do that through Kindle Direct Publishing. You can also create made-to-order physical copies of his books through CreateSpace. Hope that’s helpful! Many great products from the USA are in high demand in Cambodia. There are abundant of sellers are selling online and shipped to Cambodia. The prices are quadruple when it is shipped to Cambodia. My question to you if Amazon can open a warehouse in Cambodia and the cost will a lot less but greater profits for Amazon. Plus it can be also be shipped neighboring Asian countries. This will bring big business for Amazon. If and you decided to move forward with the business I can provide you with security and guaranteed from the Cambodia’s Prime Minister. Please let me know who I can contact. I am looking forward to hear from you soon. Thank you for your time and consideration. Much blessings! We live in Georgia so I don’t access a bank account that Amazon approved it. because Amazon doesn’t support my country. Unfortunately we can’t provide any advice in this area. There are plenty of sellers in our Facebook community that have experience with this so it’s worth joining and seeking advice from the community. Hello! Am Gift from Zambia. I want to start selling on amazon but my country is not included in the disbursement list. Is there any other way around this problem apart from opening a bank account in the U.S.? Unfortunately, we’re not sure. You might seek some legal advice on this matter or contact Amazon directly and speak with one of their reps. They may be able to help. Hello, I am already selling on Amazon EU market. Now i want to start selling in US market. I have electric products like beamer lights and other sets of lights. In European markets, I have a very good ranking. Can you guide how can I get FCC for electric products? and how can I check which products need FCC? I have CE certificate for all my products. Myself Laila. I am from Portugal. Also, I am very much interested to sell on Amazon FBA. Now I need some information about this business and how can I get into it. Also, can I sell products on UK/USA or even in Europe? I will be highly appreciated if I will get some important data to start my next step. I have just purchased a jungle scout web app (which is fantastic) and I am in a process of doing a product research as i would like to start selling on Amazon in US. I am based in Europe and struggeling now to understand what is the process of setting up a legal entity in US in order to pay tax there and to create an Amazon seller account. I understand that i do not need to set up a company in order to start Amazon FBA, but rather only obtain tax number or something of that sort. Could you kindly advise on what is really needed to set up some sort of entity or register myself with local authorities in US in order to start selling and paying taxes. I would appreciate if you reply directly or point me to any potentially usefull source of information. I intend on signing up with Jungle Scout to become a Amazon Seller. However I am concerned, I am a resident of Zimbabwe, a country not accepted for seller registration on Amazon. I have access to a US bank account via Payoneer. Am I able to sell on Amazon FBA? We can’t give any advice on particular situations like this, but you can check in with the residents of our Facebook Group who might be able to help or share personal experiences. I’m looking for information about how to sell in USA to Italy; I’m a private, I have not a company; Amazon support told me that it’s possible and I have to ship my products by UPS or DHL etc. Reading the Greg post I see that he uses these services; I wrote to UPS but they told me that they can’t manage my shipping with FBA because I’m a private…I wrote again to Amazon and this is the answer: “you are able to ship units from Italy to Amazon US warehouse by using non Amazon partnered carrier. You have to list Amazon as the Ultimate Consignee and use Samuel Shapiro & Company, Inc. for customs clearance services and abide by its guidelines” Ok, but if I use non Amazon partnered carrier it’s impossible to use the FBA services, isn’t it? I feel like I’m in a loop, sorry! Another solution: I have friends in USA, maybe I can send the products to them and they can ship to FBA . What do you think about? Thank you! It’s difficult to diagnose the issue you face from the outside and without any experience of importing from Italy to the US. I would recommend checking in with the residents of our Facebook Group to see if anyone has any similar experience and can help you out. I’m linving in Italy and I’d like to sell on Amazon.com , in USA, as private seller ; I wrote email to Amazon, I read a lot on internet, ok, it’ s possible BUT If you have not a company it’s impossible to use the FBA services; I asked UPS if the can manage the shipment for me with FBA but they say it’s impossible for private account. So, I’m thinking to send my products to some friends in USA, they could manage the shipment directly there with FBA; do you think is it possible to use my credit card and bank account for the exspenses? I don’t like to bother my friends. Thanks for any tips! As I understand this, your products are manufactured or already situated in Italy? You want to ship them to Amazon in the US and sell them on Amazon.com. Ultimately, you can sell your products on Amazon FBA so long as you have a seller central account and are able to ship them to a fulfillment center (and meet all of Amazon’s requirements of course). There may be specific requirements for your particular product, or your location that I am not aware of. You could try asking in our Facebook group, to see if anyone has particular experience with your issue. Hope you are able to figure it out soon! I want to be a seller on Amazon.com from outside the US. From the information provided, I understand that an international credit card is necessary to set up a sellers account. My native country is one among the Amazon sell countries but I have an international debit card with a local bank! Is that acceptable during registration or should it mandatorily be a credit card? I’m not actually sure on this one. I know that in the US the term “credit card” is often universally used to mean any bank card, so a debit card may also be accepted. It’s very common in other parts of the world not to use credit cards and only debit cards. You could always try registering with your debit card to see if it’s accepted. Can I create a selling store in amazon while living in Portugal. Absolutely, the guidance in this article is about how you can sell in the US on Amazon.com from other parts of the world. because even if you do setup a Payoneer account, when registering to be a seller on Amazon US you must select your home country. Some countries i.e South Africa, Colombia, Nepal are not part of the drop down list. Therefore people staying in those countries will not be able to complete their registration on Amazon Seller Central. It is not enough to just setup a Payoneer Account. My Question is…quite same as Omer mentioned above. Can anybody please help ? I want to sell on amazon BUT I live in a country that’s not listed in the amazon sell countries. from the bottom of my heart thank you for the information you have been giving. My Question is… I want to sell on amazon BUT I live in a country that’s not listed in the amazon sell countries. Thanks for this. I’m curious… does it also work the other way around? Are US sellers allowed to set up a UK Amazon seller’s account? If so, how would you go about getting a UK bank account? Has anyone accomplised this? You can set up a UK Amazon seller’s account if you wish to sell in that marketplace. You can actually set up an account that you would be able to use across the European marketplaces. An alternative to setting up a bank account is to use a service like Payoneer or World First. Hello janet, i m lucy. one of the seller but in mid level. i would recommend you to visit http://www.evantage.store. they are actually good at providing consultancy for managing and opening account on amazon. previously in usa and currently in uk, they are offering services. one of my natives in uk has taken services from them. now they have seen a boost in their sales. feel free to contact anytime. Glad you are enjoying the blog. What exactly are you looking for as far as help? Jungle Scout supports a bunch of marketplaces–UK, Germany, Spain, Japan, Mexico, etc, so if you want to do product research for those markets, you can certainly use Jungle Scout! If you have other questions, please just email [email protected] if that doesn’t answer your question. Hello, I have payoneer but my country is not included to sell on Amazon. Is there any way around this? I want to know if we can get a bank account in other countries instead of US that Amazon accepts. Such as Switzerland. And then transferring that money to my country Pakistan. Would that work? Can we use payoneer account instead of US bank to receive payments. Would you be able to let me know please? I haven’t tried this personally but it seems like it would be a good option. Let us know if you find it works for you! That is a great article. I read the whole article. It is great. I would like to ask one thing from you. It would be great if you would be able to help me. Can I use my Payoneer debit card instead of US bank account? It is also mentioned in the article that in most cases what you need is not a bank account per se, but the functions provided by a traditional bank account. Any help would be greatly appreciated, friend. I don’t know for sure but that sounds like a great idea. Definitely worth a try. Let me know if you find this works for you! Hey, thanks for your blog, I bought JS Pro three days ago, so I’m new to this fabulous tool. JS is inspiring me to enter the world of Amazon FBA or private label, so I am new to this world of Amazon, I only see it as an affiliate of Amazon.com. I live in Mexico, so I would appreciate an orientation about basic courses on the use of the Amazon platform, which will tell me to step by step how; Registration, entry of products from China to Amazon.com warehouses, generation of lists, etc. Great to hear that you’re enjoying the tool & feeling inspired. At the moment, my best advice is to follow along with our Million Dollar Case Study. We’re up to Session #13 already, but you can catch up on each session in a detailed recap here. You can also sign up for future updates on that page too. We’re giving an over-the-shoulder look at what it takes to find, source and sell a profitable product on Amazon & we have lots of experts joining us along the way. I think you would find it very useful. Sure, Kym that helped me a lot. But I would like to ask one more question is it feasible for an LLC to open a bank account in the US if I am not physically available in the US. Getting an LLC gives you the opportunity to open an account in the US. But if you are not physically in the US, I believe it is still possible, but more difficult. If I don’t have a bank that is based in one of the countries supported by Amazon Currency Converter for Sellers. Do you have any idea how would I be able to get one? Any help would be greatly appreciated. If you can’t use your bank account in your country then I would recommend setting up an LLC to become an Amazon seller in the US, which will allow you to get a US bank account. Read more about this in our recent case study recap here! Thanks for the great blog! Quick question, I have a UK account as I’m based in the UK and I sell in the UK. I would like to sell in the US. Is it possible to set up another account (an American account) and sell in America? Sure thing you can set up an account for Amazon.com and sell in America. We recently just covered some aspects of this in a session as part of our Million Dollar Case Study in terms of tax & legal structure too. In short, you may want to look into setting up an LLC and a US bank account – Read more here! Thank you for your great information. I’m already sell on amazon. When I started selling on amazon, I faced the problem of ranking. Then I post my all problems share on forums, they give me lot information. One of them told me , he is an Amazon seo expert. He give me skype : seo24hour . I contact them and they rank my product top of the page in a keyword. Now , my question is that harmful for my seller account. Please help me. It’s hard to say without knowing the techniques the SEO expert will be carrying out. It’s certainly not harmful for your seller account to get your products ranking well. But perhaps you are more concerned about giving access to your seller account to third parties? Obviously this does associate an element of risk. Thanks to Greg and Gen for the informative videos and Webinars. I am a German expat living in Turkey. I never sold anything online but I am definitely willing to invest in international online selling in the USA market. Is it possible (or allowed) to open an FBA account on amazon without having been a basic seller before? Is a business license required to open an FBA account on Amazon.com? I believe it must be very difficult to sell internationaly with a basic account. Shipping coast and waiting time will make selling overseas almost impossible I guess. Thank you for your blog post, very informative. I live in Georgia and my country and currency is not supported by Amazon Currency Converter for Disbursement. Is there any other way I can sell my products on European Amazon? Maybe there are some intermediary companies I can use, we don’t need currency converting, just intermediary bank account supported by Amazon. I live in Canada and wish to sell imported products (from outside North America) on Amazon in the US. Is that doable at reasonable costs? It’s definitely possible, as Greg highlights. The most difficult parts, potentially, are figuring out how to efficiently import and store products, and financials/tax. Individual circumstances will vary so Greg covered some of the top level stuff you need to get started in this article. The benefits are that Amazon U.S. is the biggest marketplace with lots of customers, so if you get it right, there’s lots of opportunity. Are you thinking of setting up to sell on Amazon U.S. this year? I’m still in the research phase of starting with FBA. I’ve learned a lot with your posts and videos so thanks for sharing such helpful info. I see you are living in Spain. I am from the US but have been living in Sevilla for about 15 years so your post confirming that it is realistic to sell on Amazon US while living here was inspiring. p.s. What part of Spain do you live in? My name is Rafa. I have been selling on Amazon for a year now, only Europe for now. I live in Cordoba and I have found very interesting that someone else so close to me is trying to get set up on Amazon as well. You can find me on The Amazing UK Seller fb group. Feel free to drop me any message if you want to. BTW> Fantastic post Greg! Thanks a lot! Hi! I Love listing to your episode’s. Would love to be by your webinar but will not be able to make it, will you post it afterwards on your site?